Click to rotate, drag to move. Match 3 or more of the same puzzle tiles to reach the goal. Drop the tiles with strategy in this addicting puzzle game. Connect cookies to serve your customers and make them happy. Can you fulfil the hungry bear&apos;s cookie cravings? Dozens of puzzling levels! Making a delicious bread requires your puzzle solving skills to quickly collect all ingredients needed! Link and match the ingredients to claim your high score in this game! More power-ups, more fun! Connect cookies to serve your customers and make them happy. Can you fulfil the hungry bear’s cookie cravings? Dozens of puzzling levels! Are you ready for a super sweet puzzle challenge? Enjoy this sweet switching game with spectacular effects! Match fruits and vegetables to prepare for harvest time! Help Dr. Atom and Quark to complete the match 3 challenges in this fun action packed game! A big group of penguins is caught in a pile of ice cubes. Tap the cubes in groups of 3 or more to set them free! Enjoy this classic zuma bubble shooter game in the mystic jungle! Shoot and link magical stones in groups of three, let the adventure begin! Drag and drop the vegetables to the farm field, place 3 or more of the same vegetables adjacently to meld them into something new! An addicting game that challenges your strategy and puzzle solving skills! Escape into this colorful strategy-filled world of matching and combinations! Swap planets and make them disappear in this great strategy game. Connect and match the fluffy pets to free them from their cage. A cute and addicting match 3 game with all kinds of farm animals! Shoot colorful bubbles with magical experiments. Follow classes at the Academy to learn all about magical bubble shooting and become top of your class. New update with 1 new world and 20 new levels! Chase down the trail of Montezuma and discover the power of the mysterious statues. Have an adventurous journey and hunt the precious jewels in this classic Match3 game for every age. Swap adjacent tiles to make rows of at least 3 same-colored tiles to get the rare jewels and remove them from the field. Bigger combinations will give you special jewels and bonus points. Unlock the mystical statues and find out their individual powers. Will you discover the secret of Montezuma? Solve the puzzles to defeat the enemies. Connect and match potions of the same color to unlock different powers. Use strategy to win the battle. Collect as many gems as possible in this block collapsing puzzle game. How far can you and Professor Gatou go? Match gems, activate powerups and solve puzzles in this great new game! Jewel Academy is a gem-filled, action packed game with a ton of levels to complete. Updated with 40 new levels, 2 new worlds and 1 new magical pearl!! Welcome to Tiny Garden! Beat the unique match-3 puzzles, explore special garden decorations, and discover new friends in the miniature worlds. Come back daily and take best care of your plants! Unleash the Jelly Madness in this free Match 3 puzzle game. Crazy power-ups bring in unlimited possibilities in this fun game! Play this addicting bubble shooter game with cute pets. Shoot bubbles to form groups of 3 or more of the same color. Destroy bubbles, earn points, and move to the next stage with special power-ups. Put three of the same pizzas together to finish the order and get them out of the kitchen. Don&apos;t let your kitchen get too full! Dive into the ocean and go on an underwater adventure! Your task in this cute Bubble Shooter with a twist is to clear the star in the center of the rotating field. Aim carefully and match at least 3 same-colored bubbles to pop them. Collect golden shells and buy powerful upgrades which can help you master difficult levels. Can you unlock all areas and earn 3 stars in every level? Shaman&apos;s treasures are yet to be discovered! Match a chain of gems to activate magical power-ups. Solve puzzles and discover powerful treasures in this exciting match-3 puzzle game! Click on groups of 3 or more fruits to remove them! Use bombs and special power-ups to blast them all! Experiment, explore and convert metals to the philosophers&apos; stone! Match a chain of mystical elements to activate magical power-ups and discover the universal elixir in the alchemist lab! This brave alien needs your help to defend his planet against evil invaders! Eliminate all the bubbles and send them back to where they came from. Crash and destroy everything on the dragon&apos;s way! Unleash powerful attacks to fight against the marching warriors from human kingdom. Click and match strategic attacks in this action-packed puzzle game! Open the scroll of 1001 Arabian Nights, and let it take you to the land of mystery and magic. Match unique Arabian jewels, activate power ups and solve match 3 puzzles with strategy. Can you complete the quests? Quickly link and clear these alien Burdies from the grid! Enjoy this action puzzle game with fun powerups. Play this classic bubble shooter game with pretty Christmas ornaments! Merry Christmas everyone! Shoot a bubble on groups of the same color and destroy them all. Play bubble shooter in a scary Halloween mode! It&apos;s time for divers to head back to the surface. Tap and clear the corals to make way for them! In this mystic world you can catch and train the cute bubble monsters with special powers. Collect the sparky bubbles to unlock your monsters’ special abilities. Let&apos;s catch them all! Classic bubble shooter. Relax and enjoy the game with timeless fun! Can you arrange all of these wacky monsters before they start falling off the cliff? Match 3 monsters of the same kind and clear the queue! Help the sheriff kill as many zombies as you can. In each level, the sheriff will appear to tell you which zombies you must shoot. Try to match the zombies in the game by creating match 3 combinations! Play away combinations of identical blocks. Click any combination of three or more identical blocks next to each other. Pop all the blocks ! Help valiant knight to fight against evil on his way to glory. Link and match special powers to defeat the monsters! Match and merge the mystical jewels! Play away any combination of three or more identical gems to collect all the treasures! Assemble a team of monsters to challenge the enemies. Link and connect your troops to form strong alliances and become more powerful in battles. Go on a Crusade! Destroy monsters to score points and unlock levels. Getting as many monsters adjacent to each gets you the most points, so think ahead and have fun. The screen is overflowing with brightly colored blocks! Select 2 or more matching blocks to make them explode. Wait for longer chains to get more points. See if you can clear the whole grid for a Bronze, Silver or maybe even a Gold trophy! Play this cute match 3 game for free! Match the kitty, bunny and bear to score points and win coins. Save the pets and they&apos;ll help you progress through the different levels with great power-ups. Come and play in this magical animal puzzle world! Penguin pirates are marching towards your snow castle! Click on same-colored snowballs to shoot at the penguins! Select larger groups of snowballs to make combo attacks! In this addictive Steampunk Match3 game your task is to repair as many beetles as possible within the given time. Connect at least 3 tiles of the same type and make chains. Every bug finished will give you 5 additional seconds - can you set a new high score? Deliver treats by matching rows of 3 or more items! Meet the whims of a cat on time to unlock new items! Arrange the Christmas decorations in groups of 3 , and use your imagination to create brand new ornaments! How would you like to decorate this holiday season? Enjoy this relaxing puzzle game, in Christmas style! Best Candy Friends takes you into the world of delicious candy and challenging puzzles! This is a classic match 3 game with cool bonus items. Play now and enjoy the sweets for free! This monster loves Halloween and he’s all dressed up for some trick-or-treating. Can you help him fill his pumpkin bucket before all the candy crushes him in this cute bubble shooter game? A glittering Match3 puzzle game. Create bigger matches for awesome boosts. Can you reach a high score before you run out of moves! Slide and connect the green bouncing jellies in this cute puzzle game! Think ahead which path the jelly should take to collect more stars and coins on the way! Grab and drop monsters to make a match. Connect and combine them to create new creatures. Be creative in your monster lab! Classic free online bubble shooter game for everyone to enjoy! Your goal is to clear all the bubbles from the board and score as many points as possible. Bubble Charms is a fun Bubble Shooter game with a cheerful design and smooth game play. Match 3 of the colored bubbles to pop them. Tap on groups of three or more of the same toys to remove them. Your goal is to bring the toys down to the conveyor belt and keep your toy factory running! Jewels are a girl&apos;s best friend. Find all the jewels and jewel brands in this glamorous word search game. How many levels can you finish? Swipe each piece of fruit as fast as you can. How quickly can you clear the table? Collect, connect and pop luck charms to get best luck and fortune in your life! Get gold coins, four-leaf clovers, jewels and more surprise items in this fun puzzle game. Help the little genie in her magic shop and serve the fairies beautiful jewels! Swap and match at least 3 gems in a row to remove them from the field. Earn extra coins by completing goals, battle against mighty bosses and try to beat all 101 levels! Gold Mine Strike brings a new way of playing Gold Strike. Throw pickaxes, get rid of blocks and use powerups to enhance your progress. A unique sliding Match-3 puzzle game. Move monsters up, down and across to destroy the monsters! Make combinations of the jolly jelly blocks and get enough points to pass the levels. Start a puzzle challenge with fascinating neon lights! Match 3 or more fruits to make delicious smoothies for your customers. A cute restaurant management game for you. Enjoy! 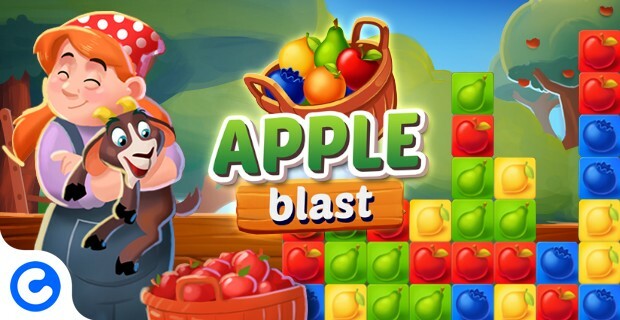 Catch all the fruit and party away with this match3 puzzle game. Create bigger matches for awesome extras! Take a whirlwind tour across the magical land populated by cute wizards and wake them from slumber! Complete all missions – fill the star meter, collect jade crystals, and prove yourself as a master wizard. Can you make it through all 30 levels of puzzling action? Match the yummy fruit as quickly as you can. Enjoy this new type of match 3 and fast-paced puzzle game online for free! Dig a mine to find the hidden treasures! Destroy the blocks by matching blocks of the same color. Golden blocks and gem blocks give additional score! Gioca gratis online a giochi di combinazione. Abbina colori, numeri, forme e dimensioni in questi divertentissimi giochi di combinazione, puzzle e di collegamento.